Everyone wants a comfortable clean home, but with limited time and budgets, it seems there is really no way to do it. Or, maybe you are off to a good start but looking for a little more inspiration? In The Hip Girl's Guide to Homemaking, take a tour through some great ideas to create the home you want in a fun and frugal way. 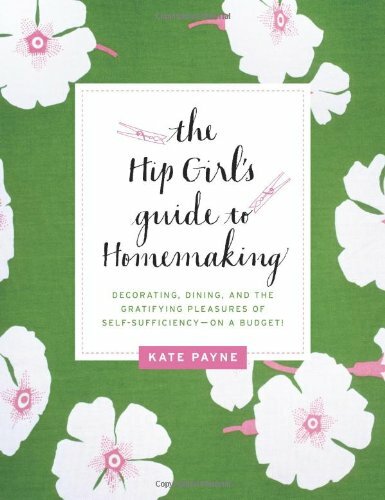 The Hip Girl's Guide to Homemaking has the subtitle Decorating, Dining and the Gratifying Pleasures of Self-Sufficiency - On a Budget! This isn't the "live off the land" kind of self-sufficiency books I tend to go for, but one for finding ways to keep your home stocked and clean in a way that doesn't harm the planet - or your wallet - any more than you have to these days. Broken up into three sections, Kate Payne addresses the house in Part I, dealing with decorating all the rooms of the house in an affordable way. She highlights thrifting and Goodwill as sources for lots of home goods, how to install easily-removed curtains with IKEA Deka curtain wire, and best ways to make room for storage. Part II goes further into home improvement like gardening (both indoors and out), cleaning, sewing and the best tools to keep around the house. Part III moves into food, scaling from improving your pantry for cooking at home and preserving to how to really show the house off and the culmination of all your work by entertaining. Each chapter has little tips in either "Words to the Wise" or "Hip Tricks", a list of Dos and Don'ts highlights many areas, and Resources at the end of each chapter give both print and online resources for more information. I really like the way Payne discusses the topics, coming off more as chatting with friends than lecturing. She definitely emphasizes a greener way of living, which may or may not be ideal to some readers. A lot of what Payne discusses is for smaller homes or apartments, especially those lacking storage, but there are definitely enough tips, tricks, and reminders that make this a nice reference for those beginning to make their living space a home - no matter the size. This was an impulse buy for me, but I have been trying to get my house to better reflect the way I want to live in it. Funny, quirky and emphasizing that new is not always needed, Kate Payne brings readers a great reference book to showing the hip side of domesticity.